Track, path on good ground, stony section near Creag Leacach and boggy peat hags later in circuit. Auchavan at end of public road, north Glen Isla. Open start point in Google Maps for directions. As well as reading our description of each walking route, you can read about the experiences of others users on this walk and others. There are 5 user reports for this walk - click to read them. DO YOU FIND OUR ROUTES USEFUL? There is limited parking near Auchavan and on the right verge just over the bridge - do not park in the turning area which is required for the gritter and school minibus. From here follow the track signed for Tulchan at Auchavan off the public road heading up to the right of the building. This soon crosses a cattlegrid and follows the west side of the River Isla until the entrance to Tulcan Lodge is reached. Cross the bridge here and continue up the glen, still staying on the west side of the river - once past the forestry great views open up the glen ahead. Just beyond the edge of the forestry a path is signed "The Monega Path to Braemar" - this cuts a corner but involves crossing a ditch and burn, its easier to continue a short way on the track and then turn up to the left on a rough grassy track on the far side of the burn. This heads directly up the broad ridge of Monega with good views over to the rocky flanks of Creag Leacach to the west. As the gradient eases, leave the track to stay near the edge of the cliffs to reach the summit which has spectacular views. From the summit head west following the edge of the cliffs eventually rejoining the track near the top of Little Glas Maol and then breaking off the track to head NW directly to the summit of Glas Maol marked by a stone trig point and large shelter cairn at 1068 metres. On a clear day there are good views into the Cairngorms as well as the nearer Cairnwell hills. The old county boundary wall heads west for a short distance before curving southwards over Bathach Beag, and is easily followed with a path on the east side at first. At the bealach there is a tiny stone shelter with a turf roof and a bench inside- barely enough to accommodate a sheep, but could be useful in foul weather. From here the walk acquires more character, as a better-defined ridge heads over Cul Riabhach, with a path across the stones on the west side of the ridge to ascend to the stony summit of Creag Leacach at 987metres. Continue along the stony ridge to the southwest top (943 metres) and keep following the east side of the wall to descend SW on heathery ground and then climb again slightly. At the small cairn before the rise to the stony summit of Carn Ait it is possible to cut off the corner by heading SE to pick up the broad ridge heading east from Carn Ait. A row of old fence posts and faint grassy vehicle track lead from the bealach to Mallrenheskein and then down again to the low point, Easter Glacanbuidhe. The climb up to Black Hill crosses a section of boggy peat hags, taking a direct route following the fence is probably the best option. Tthere is an old gateway in the fence line at the top. Bear ESE and then SE here to descend to Glack of Glengairney with an old fence line for navigation. The climb up Monamenach is direct but can feel brutal at the end of the day. It rewards with fantastic views in all directions as you climb. The summit (a Corbett at 807 metres) is not seen till the last minute and is a welcome surprise and a great viewpoint in itself. The gentle descent follows a track SE to meet another track which heads east to follow the Glack Burn back down to the glen and the start point. Enjoyed this walk route or find Walkhighlands useful? Walkhighlands traffic is increasing, but advertising revenues are falling sharply. 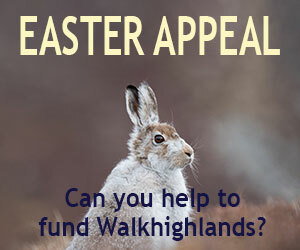 Please consider setting up a direct debit donation to help support the continued maintenance and updates to Walkhighlands. Have you found an error or is any information wrong or missing? Please let us know by clicking here.